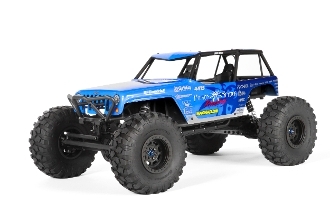 The Wraith Ready-to-Run 1/10th Scale Electric 4WD Rock Racer is another "FIRST" for Axial with the first and most realistic full tube-frame chassis design that is manufactured with high strength composite materials. The Wraith is built to go fast and is NOT JUST A LOW SPEED ROCK CRAWLER. The Axial Wraith changes the game with its impressive 1:1 scale looks, high-speed monster truck "bashability," and technical "crawl" capabilities. The Wraith is the most versatile vehicle satisfying the needs of a wide range of enthusiasts! The realistic looks, drivability and ready-to-run ease make this vehicle the perfect blank canvas for the enthusiast looking for a vehicle to build upon. The Wraith can go in so many directions; desert sand, mountain trail runner, rock racer, mud bogger and any form of backyard bashing that can be dreamed up! Within the 1:1 [full size] crawl & off-road race segments, overall tire diameters have been on the rise, literally and directly influencing the R/C crawl segment, thus this Axial Ripsaw reflects this attraction of flirting with rocks at speed with a compelling design that will give your rig the aggressive competition look and performance. R/C crawlers will clearly benefit with larger ground clearance where it counts as the Ripsaw measures 5.5" [140mm] in diameter. This gives the lowest point on the 4X4 axle housing more clearance thus giving you many more tactical driving options in those sticky predicaments! Speaking of "sticky," Axial offers the 2.2 BFGoodrich Krawler tire in a R35 sticky rubber compound noted with a "white dot" on the outside carcass of the tire.